As a child growing up in Western, Pennsylvania. Shella Shubuck could always be found with sketchbook in tow. And her love of art grew right along with her. Determined to be an artist, Shella formalized her study of art at Rochester Institute of Technology, majoring in Fine Arts: Painting. In 1991 Shella started her own business named ShellaÃ²eations and developed a line of hand sculpted papier-mache ornaments, figurines and greeting cards which she has sold at art and craft shows throughout the Western NY region. 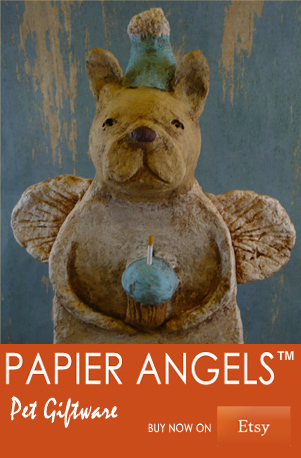 She has a pet giftware line of dog and cat angels called Papier Angels™ which she sells on ETSY. In May 2016 Shella earned a Bachelors Degree from RIT in Fine Arts Studio. Shella resides in Western NY with her husband Marc and stepson. A published author and illustrator, A Harvest of Friends is her fourth book. 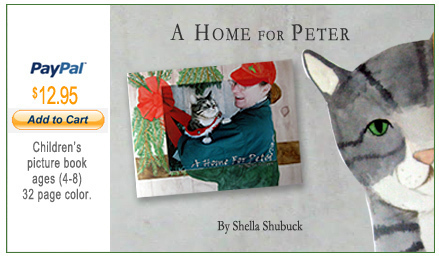 Other books include: Christmas for Isaiah (2007), I Love You All Year Round (2008), and A Home For Peter 2009. Her unique style combines hand-sculpted characters, photography and watercolor. A Harvest of Friends: Every year at the harvest, Ruby travels with her family to Stokoe Farms and their great pumpkin patch. She visits Bunnyville where her aunt and cousins live and her special friend Lucy. Ruby is excited about her harvest party, but when she finds out that her cousin Cole won't be there because he doesn't like her friend Lucy, this upsets Ruby. Join Ruby and her family as she learns to sow her seeds of kindness and reap a harvest of friends. 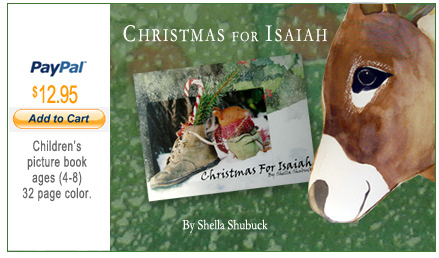 Christmas For Isaiah: When little Ruby receives an unexpected Christmas present from her friend Isaiah, the donkey, she feels really bad because she doesn't have a gift to give him in return. Ruby is at a loss for what to give him. Then she remembers his favorite things and realizes it's not what you spend, it's the thought that's put into it. She gets to work and decides to bring Christmas to her friend. What she doesn't anticipate is bad weather. When dinnertime comes and there's no Ruby to be found, her family is worried. Seeing how bad the weather is they set out to find her. They find Ruby safe in a manger with Isaiah, and are all together to celebrate Christmas. Being together, in a family of love... the true gift of Christmas. A Home For Peter: Ruby the rabbit and her family were visiting their old friend Isaiah the donkey at the Christmas Tree Farm where he lives. In the stable, sounds of talking and laughter filled the air, when suddenly -c-r-e-a-k- the stable door opened. "Who's there?" Ruby asked. A small, furry, dark head peeked around the corner. "Who are you?" Ruby asked, her voice quivering. "I'm Peter," he said. Join Ruby and her family as they search the Christmas Tree Farm to find a home for their new friend Peter, because everybody needs a home, home is where you belong. I Love You All Year Round: A mama mouse assures her baby that she loves him all year round in this charming padded cover pop-up book. Parents and their children--who know that love lasts through countless harvest moons and cherry blossom blooms--will love this little book. Available on Amazon.com.